"If it was never new, and it never gets old, then it’s a folk song." Inside Llewyn Davis is the Coen brothers' mundane yet punishing look into the burgeoning 1960s folk music scene in Greenwich Village. Actor Oscar Isaac (Drive, The Bourne Legacy) is superb as the titular terminally down on his luck, tortured folk singer and musician (inspired by Dave Van Ronk) barely living a life worth singing about. It has all the Coen hallmarks with simultaneously bleak and darkly comic performances. What ultimately makes the film is the music. Filmmakers Joel and Ethan Coen, along with music supervisor T Bone Burnett, have crafted some memorably authentic tunes to fit the era and style of the time (particularly the fake novelty song, "Please, Mr. Kennedy"). Isaac is game, pulling off the songs in a fine manner throughout with the right amount of jerk-ish charm and sour candour. It's an unsympathetic, quietly stoic role contrasted by his relationship with one memorable house cat. Songs play out organically and sublimely, connecting a series of vignettes as Davis goes from gig to gig and couch to couch, struggling to carve out his own existence and identity in an increasingly hostile world. Small bit parts and colourful characters are played finely by talents like Carey Mulligan, Justin Timberlake, and John Goodman, among many others. They, along with Isaac, deliver trademark Coen dialogue with fine precision and artistry. We explore what divides characters in the art scene and divisions from "squares" and true artists, suffering or being tortured for or by their work. The lack of narrative focus is refreshing, rather than meandering or aimless, as we follow Davis through his stumbles trying to be true to his art form in hostile environments. Through scenes of touching musical performances on all manner of stages, we see how Davis endures through the grieving process mourning the suicide of his singing partner before the events of the film. It's also a supposition on a single artist unable to move on or make way without his creative partner as well as an exploration of folk singers respected at the time but long forgotten by history. The Coens have created a rich, musical world that fits right into the real Bob Dylan inspired musical scene we all know. It's a melancholic, starkly unglamorous look at the era before the folk music explosion. It's so earnest in its exploration of themes paramount to songwriting and musical inspiration. 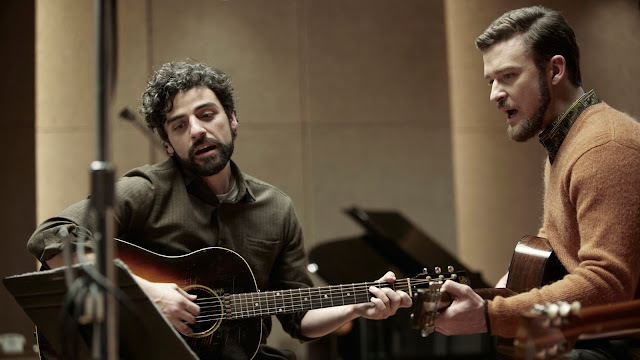 Inside Llewyn Davis delivers exactly what's expected with dazzlingly understated performances and deeply engaging songs. It's a true marriage of music and cinema at its finest.